The Bookshop & CPS, Special Edition. This Thursday, Oct. 30th, at 7:30 pm, we’ll be hosting a special edition of the Collected Poets Series, a partial fundraiser for the Mohawk Arts and Education Council. Baron Wormser, former poet laureate of Maine, will read from his latest collection of new and selected poems, Scattered Chapters; Jim Schley will read from his newest book, As When, In Season; and the MAEC high school poets will read from their work. To read more about the Collected Poets Series and the featured poets, please visit the Collected Poets website. Between visits of customers distraught over the closing of the bookshop, and the exhausting motions of commiseration such visits bring, I’ve been reading Baron Wormser’s The Poetry Life: Ten Stories. Each story is narrated by a different fictional persona, who in turn is writing about a different poet. The stories aren’t especially plot-driven, but explore how poetry, in even small ways, can affect a wide array of ordinary lives. It’s simply uncanny how expertly Wormser creates these personas, entire lives encapsulated in a few pages, and then incorporates the poets as well. …when Helen died I started to hate words because they were so general: “Well, we got to be with each other for a lot of years. I’m not complaining.” Or “We had our ups and downs but we hung in there together.” You get my drift. You’re always summarizing because no one wants to listen to the details. People are willing to listen some but not too much. They want an idea of what something was like that they can nod their heads to. 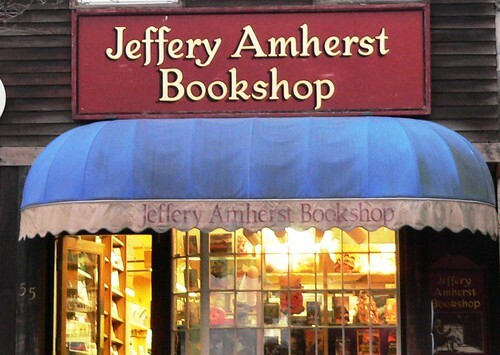 It’s official: the Jeffery Amherst Bookshop, my place of employment for the past 10+ years, will close its doors within the next few weeks. This economic climate became the perfect storm we couldn’t survive: with the confluence of the credit crunch (no financing for potential buyers), the changing paradigm of the book & textbook business, and of course the ever-present demons of B & N and Amazon… well, barring a White Knight arriving on the scene with a Big Fat Wad of Cold Hard Cash, we’re done. One of the more inconvenient aspects of parenthood, for me, is that I can’t simply sit down and read a book whenever the mood strikes, which used to be pretty much all the time. 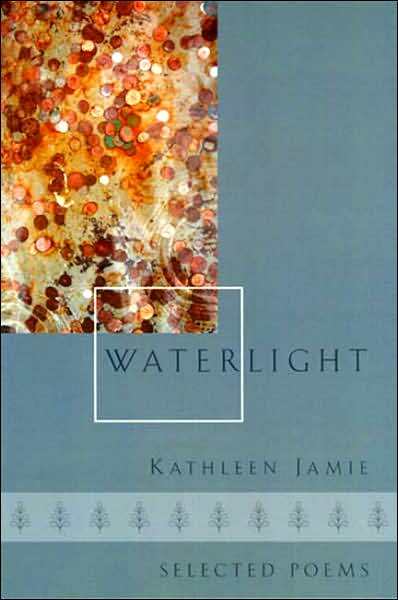 But I did manage to carve out a fair amount of time this weekend to spend with the Scottish poet Kathleen Jamie’s first book to be published in the U.S., Waterlight: Selected Poems (Graywolf Press, 2007). Most of this collection is comprised of shorter poems, only a page or so; some are in dialect, but not especially difficult to decipher. They’re meditative, dealing primarily with the natural world, and while the weaker poems seem to merely skim a pretty surface, overall, I really enjoyed this introduction to Jamie. following, like a fist of purple kelp. He’s a Lumberjack & He’s Okay. My life day to day was lived through ordinary actions and powerful emotions. But the more ordinary, actual, the more intense the day I lived. The more I lifted a child, conscious of nothing but the sweetness of a child’s skin, or the light behind an apple tree, or rain on slates, the more language and poetry came to my assistance. The words that had felt stilted, dutiful, and decorative when I was a young and anxious poet, now sang and flew. Finally, I had joined together my life as a woman and a poet. On the best days I lived as a poet, the language at the end of my day — when the children were asleep and the curtains drawn — was the language all through my day: it had waited for me. Our little hilltown was swarming with tourists today, with cars parked along all the side streets, and the Bridge of Flowers teemed with people and their cameras. Vincent usually loves to run down the Bridge, but there was just too many people. When we reached the other end, I so wished I’d brought our camera, because what did we come upon then but several troupes of Morris Dancers! We’ve reached that stage where the child finds it necessary to give the parents positive reinforcement. Is my need for praise that obvious? And apparently I lack imagination, because when I look in on him during those suspiciously quiet moments in his room, he explains that he’s cooking pizza or shaking his booty (yes, truly, this is something he does) in a tone of voice I can only describe as professorial, with his hands raised and held out from his shoulders as he shakes them. 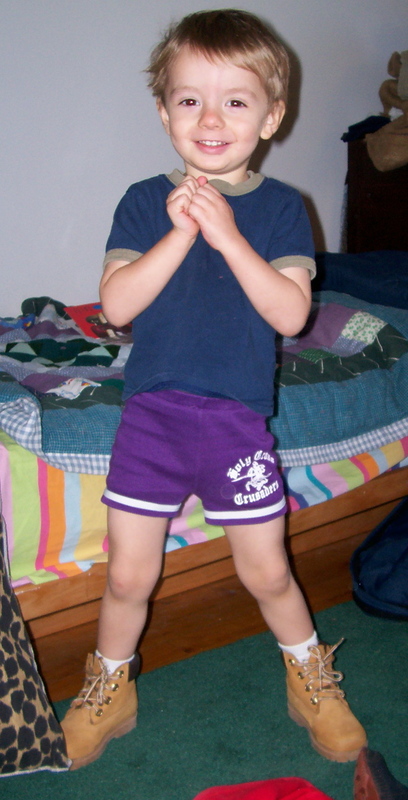 I can’t say for sure where he gets this from, but I have my suspicions…and it’s not me. 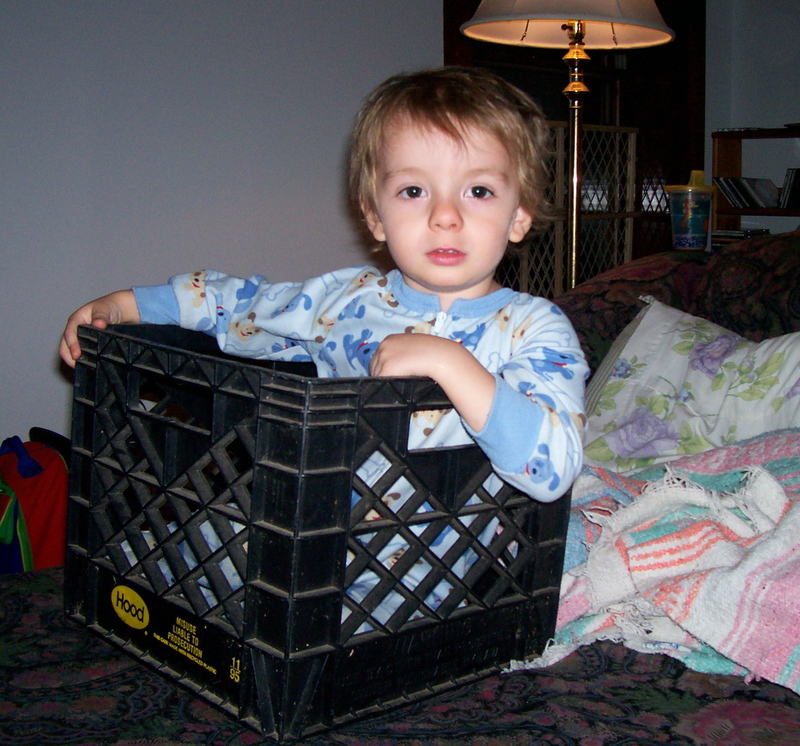 "This is not a crate. This is a boat. Okay, Mommy? A boat." and she had a tumorous kidney removed. they are not us. That’s the whole thing. They are not us. It sounds simple yet it means so much. so then we have sent them a card. Not only did I have the great fortune to see and hear Carol Frost and Michael Waters at the Collected Poets Series reading this past Thursday, but then I was able repeat the experience as they both took part in the Brattleboro Literary Festival this weekend. In addition to the comedy duo of Alan Cheuse and Robert Pinsky (truly, these old friends really know how to riff together! ), they were my favorite readings of the day. Michael has a confident, dramatic delivery that really brings his poems alive, while Carol’s voice is softer. She read some new poems from a series she’s working on, which she describes as a collaboration with her mother, who has dementia. I think of them as an expansion, a deepening of her “Apiary” poems included in The Queen’s Desertion. Really moving work. I can’t wait to see them all collected together in the pages of a book. I love the picture of her below, how it captures her impish generosity. Between poems she told the briefest of stories, flashed that smile. In fact, both she and Michael showed the utmost consideration to their audience and fellow readers, taking not a minute longer than their allotted times, graciously sharing the stage and the spotlight. It always surprises me when poets showboat or try to upstage one another, but not a whit of it came from Carol or Michael. disgorged the lies and scared away with a stick a snake. What made me covet that which I could not have? I’ve felt undeserving. I’ve made myself ill with the glory. Even the falling leaves gesture their renunciation. I disgorge the lies and abhor the serpent’s hiss. and grieve. I walk in catacombs. the falling leaves gesture their renunciation. I remember being in a field touching a man’s body. and things that hold their breath for shame. His skin was soft as a girl’s and he closed his eyes. we were lying in a field and I touched his body. as when in a green place the air holds its breath for shame. What made me covet what I could not have? petals falling singly, the yellow snake disgorging lies. I’ve grieved and walked in catacombs. a thrashing in my rib cage. and scared away with a stick a snake. and things that hold their breath as if for shame. I’ve made myself ill with the power and glory. disgorging lies. A thrashing in my rib cage. I remember seasons. Things that hold their breath for shame. Things I bring with me from far away.